Property developer CL Integrated Resources Sdn Bhd plans to launch by next year a high-end gated residential project worth RM500 million in Seksyen U10 in Shah Alam, Selangor. Its founder and executive director Chu Bak Teck said the 50-acre development will comprise 400 units of hillside bungalows, semidetached houses and villas, priced from RM1 million. Chu said CL Integrated has submitted the layout plans and is awaiting the authority's approval. "If all goes well, we hope to start construction by mid-2011 and launch the project six months later," he told Business Times in an interview. CL Integrated is owned by four individuals, who have more than 10 years of experience each in real estate development. The other three directors are managing director Kenneth Lim, John Lam Joo Onn and chairman Datuk Pua Kim An. The company's existing project is 1 Sentul Condominium in Kuala Lumpur, which is being developed in a 50:50 joint venture with Zalam Builder Sdn Bhd. Some 95 per cent of the 284 units, each priced from RM317,800 to RM903,800, have been sold. The project is expected to be completed by early next year. 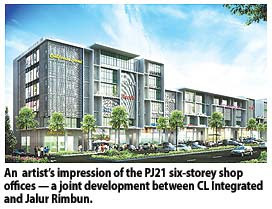 CL Integrated's latest development is PJ21 on 2 acres of freehold land in SS3, Petaling Jaya, comprising 21 blocks of four and six storey shop offices. This is a joint development with low-profile Jalur Rimbun group of companies. Chu said 80 per cent of the blocks were taken up less than two months after the soft launch. Buyers were mainly local businessmen buying for their own use and for investment. He expects the remaining blocks to be sold by July. The four-storey blocks are priced from RM2.88 million each, which the six-storey is selling at more than RM5.95 million per unit. "This is evidence that the property market is improving. We are optimistic on the outlook and are looking for more land to buy," Chu said. Chu said construction on PJ21 is expected to start next month and the project will be completed by December next year. Iskandar Investment Bhd, which oversees a special development zone in Malaysia’s southern state of Johor, will offer RM1 billion worth of contracts for retail outlets, hotels and office space by the end of this year, an executive said. Financing will come “substantially” from equity from partners Chief Executive Officer Arlida Ariff said in an interview today. The rest would be through bank borrowings, she said. Malaysia’s government launched the Iskandar development in November 2006 with the hope of attracting 382 billion ringgit of investment into the area in two decades. State-controlled Iskandar Investment will tender out another six packages of contracts worth 250 million by the end of this month for the construction of schools, a stadium and initial administrative buildings for a Legoland theme park, Arlida said. Iskandar Investment has seen a “marked increase” in interest from foreign investors from Southeast Asia as the global economy recovers, Arlida said. In particular, there was been growing interest out of neighboring Singapore, she said. “For the balance of this year, we will be going out quite aggressively into the region, focusing mainly on Asia,” said Arlida. “We will be travelling to China, South Korea and possibly Indonesia in the next three months” to attract investors and speak to people who’ve shown interest in the past, she said. Many developers have yet to seriously consider the potential of sustainable development via the use of green technologies, a senior minister said. Housing and Local Government Minister Datuk Seri Kong Cho Ha, however, noted that several industry players had taken up the green challenge. "Several of the industry's players are well on their way to creating the first batch of sustainable development in the country," Kong said. He spoke to reporters after opening "The Green Solutions for Property Development 2010" conference in Kuala Lumpur yesterday. It was organised by the Eastern Regional Organisation for Planning and Human Settlement (EAROPH Malaysia) and the Real Estate and Housing Developers' Association Malaysia (Rehda). Kong said developers had yet to come to terms with balancing their bottomline with the incremental costs that comes with developing a green project. To promote the use of green technologies in buildings, the ministry is reviewing the Uniform Building By-Laws. "Some green technologies will be considered from the practical aspects to be incorporated into it in order to create a more sustainable living environment for homeowners, their families and the community at large," he said. Kong said 2009 was a watershed year for green in Malaysia, with the introduction of various initiatives and incentives. This included the launch in May the Green Building Index (GBI), an accreditation program with specific rating tools to encourage green building development. The GBI rating tool is seen as a major undertaking as it seeks a good energy-efficient design, indoor environmental quality, site planning and management, materials, resources, water efficiency and innovation. Property developer Bolton Bhd has signed a RM195 million syndicated banking facility with three banks to fund its expansion plan over the next three to five years. The lenders -- Affin Investment Bank Bhd, Affin Bank Bhd and OCBC Bank (Malaysia) Bhd, have committed to provide RM170 million of term loan facility and RM25 million of revolving credit facility. Bolton executive chairman, Datuk Azman Yahya, said the funds would help in the acquisition of strategic land bank, part finance its development cost and finance the working capital requirements of the group. Currently, the group's gearing ratio is still low at 0.58 times even with the full utilisation of the facility, he said in a statement here today. Azman said in line with its plan to replenish their land bank, half of the approved facility will be use to acquire land, particularly in the Klang Valley and Penang. Bolton will be launching three new luxury condominium projects in the Klang Valley and a mixed commercial development project in Puchong by end of this year with a total gross development value of more than RM1 billion. The recently concluded state-level Malaysia Property Expo (MAPEX) organised by the Seremban chapter of the Real Estate and Housing Developers’ Association (Rehda) netted RM11mil in sales over the three-day fair. 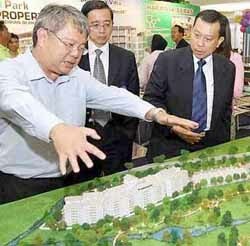 Some 20 developers showcased 1,432 properties including single and double-storey terraces, semi-Ds, shop-offices and bungalow lots during the expo held at the Seremban Parade Shopping Centre. The annual property expo is a one-stop centre aimed at providing house-buyers the convenience of selecting their properties of choice under one roof. Full info: Park Properties managing director Datuk Gan Boon Khuay (left) telling Siow about his project at the Mapex fair in Seremban recently. Looking on is Soam (centre). Rehda Negri Sembilan chairman Datuk Soam Heng Choon said the expo provided a platform for investors to grab choice properties in good locations at unbeatable deals. “With the improving economic situation, now is indeed a good time for purchasing your ideal home or office before prices start going up. “We are also mindful in ensuring our developments are environmentally sustainable and will be encouraging our members to construct more energy-efficient and environmentally-friendly homes,” he said adding that this year’s Mapex theme — Go Green — reflected the association’s commitment to promoting green living. Soam said developers were already planning sustainable development projects with the use of green building materials and through incorporating green features such as water conservation systems (rain water harvesting). “Homes today incorporate a green living concept with beautifully landscaped parks, with the use of reusable, recyclable or biodegradeable building materials to reduce waste and pollution and energy-efficient lighting systems to reduce long term utility costs,” he said. State housing, local government, new villages and public transportation committee chairman Datuk Siow Chen Pin commended the association for successfully organising the biennial expo. He also emphasised the building of quality homes and encouraged developers to incorporate green features in their projects. “With spacious homes, good amenities and public facilities, I think Seremban is also an ideal place for people working in the Klang Valley to settle down,” he said. The participating developers offered various incentives including cash rebates and visitors who bought properties at the fair also had the opportunity to participate in a lucky draw. The expo also had the support of co-sponsors Nippon Paint and Monier. PETALING JAYA: KLCC Property Holdings Bhd had posted a higher net profit of RM467.2mil for the fourth quarter ending March 31, 2010 against RM362.5mil it posted on the same quarter last year due to higher valuation surplus of its properties. It told Bursa Malaysia yesterday that the higher surplus of RM249.6mil was from the value adjustment of its investment properties of RM758mil as compared to RM508.4mil in the preceding year. The group had declared a final dividend of 6 sen per share in the last quarter, to bring the total payout for the year to 11 sen per share. For the full year, net profit was RM647.6mil or 69.33sen per share, versus RM535.65mil or 57.35sen per share. The group's revenue for the financial year ending March 31, 2010 was RM881.3mil, reflected an increase of RM14.9mil or 2% as compared to RM866.5mil it posted last year. The profit before taxation of RM1.292bil (inclusive of fair value adjustment) in the current year represent an improvement of RM259.3mil or 25% as compared with RM1.032bil for the year ended March 31, 2009, it said. It added that the increase in revenue was mainly attributed to better rental income (in particular Menara ExxonMobil and Dayabumi) and the retail mall, despite a reduction in revenue from the hotel operations. The improved profit before taxation was also attributed to lower operating and finance costs during the year. SUNWAY Holdings Bhd said its unit Sunway Geotechnics (M) Sdn Bhd has won a RM88 million deal from Sunway City Bhd to partly build an office tower in Bandar Sunway, Selangor. Sunway Geo will do the earthworks, piling and substructure works for a one- block 24-storey office tower that has a six-storey basement car park, Sunway said in a statement to Bursa Malaysia. Work is due to be completed on November 14 2011, with a construction period of 18 months.